i. A flange, or a stub, projecting from the side of a flying boat hull to increase the beam of the hull and improve its lateral stability on the water in place of outerwing floats. ii. 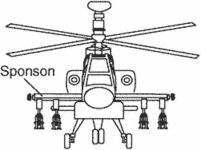 A projection from the helicopter fuselage in the form of a short, thick wing to provide an attachment for the main landing gear. iii. The short, thin, winglike structure projecting from an airplane or a helicopter fuselage to carry armament, external tanks, and other such devices. Wing tank fuel transfer is automatic by gravity so the only fuel management needed is to pump from the sponsons to the main tank when using sponson fuel. The next thing I remember was someone on another sponson throwing me a life ring, which landed about five feet from the hull of the ship. Did this trash come up from a sponson or from someone being careless? Who ate the Ritz Bits? Where liberals think the guarantee of rights a sponson which alone steadies and constrains the state morally, nationalists decry it as far too thin and too formal a basis for polity. Acknowledgment is hereby given to the program sponson, ESD-JSPR, Hanscom Air Force Base, MA and the prime contractor, Grumman Melbourne Systems Division. The additional area on the flight deck comes in part from a smaller deck house and an additional sponson. Following installation of the last sponson, we can start the countdown to refloating and final departure of the wreck," Michael Thamm, chief executive of Costa Cruises, a unit of the liner's owner Carnival Corp, said in the statement. Able to defeat 1st, 2nd generation and imaging seekers, the Manta is being offered in internal, pod and sponson mount configurations. Deborah was hit by a heavy round during street fighting in Flesquieres, the shell penetrating the tank's left machine gun sponson at a 45 degree angle. As she sailed into warmer waters, hammocks were rigged on the upper decks and a machine-gun sponson was flooded for use as a swimming pool.